Centuries ago, Native Americans roamed the forests in the area known to today's Mount Pleasant residents as Long Point. Later, large plantations were built near the Wando River and its tributaries, including Long Point, Snee Farm and Boone Hall, which continues to be a working plantation even in the 21st century. Most traces of those graceful residences and sprawling properties have disappeared, replaced by modern but still gracious homes. 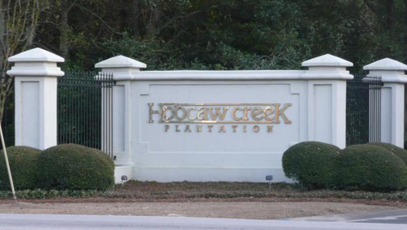 One such development is Hobcaw Creek Plantation, located just off Long Point Road. The neighborhood itself is lovely, with mature trees and shrubs adding to its curb appeal. Most of the residences in Hobcaw Plantation are large - no starter homes here - and, toward the back of the subdivision, they tend to be small estates with private docks on the creek leading to the river. Because of that proximity to the water, Hobcaw Creek Plantation is clearly a desirable location for the serious boater who still likes to be close to town. And convenient it is, just minutes from Belle Hall Shopping Center and Towne Centre, two of Mount Pleasant's premier shopping destinations. A variety of restaurants are nearby, and, should you feel the urge to venture farther afield, you'll have easy access to the Mark Clark Expressway and Interstate 26, as well as Highway 17. A glance at current listings gives a representative sampling of the executive homes that make up Hobcaw Creek Plantation, a stable neighborhood with only a handful of properties on the market. Homes tend to be in the 3,000 to 4,000-square-foot range, with prices beginning at around $500,000 and rising. Most have extra details such as central vacuum systems, extra-large garages and, in at least one case, even a workshop. Compared to the area's larger developments, some consisting of collections of multi-level neighborhoods, Hobcaw Plantation is a relatively small and close-knit community. On a typical day, you're more likely than not to see a couple of neighbors jogging down a tree-shaded road or headed to the pool. Most of the residences in this well-established neighborhood were built during the 1990s. Hobcaw Plantation has no golf course, but the clubhouse includes tennis courts, a playground and a swimming pool, and there is a community dock and boat landing.